Nothing to see here. Just a Bigfoot playing with his dog. I’m easing into this. Gotta lot to cover. Don’t wanna start any fires too soon. What’s this thing? 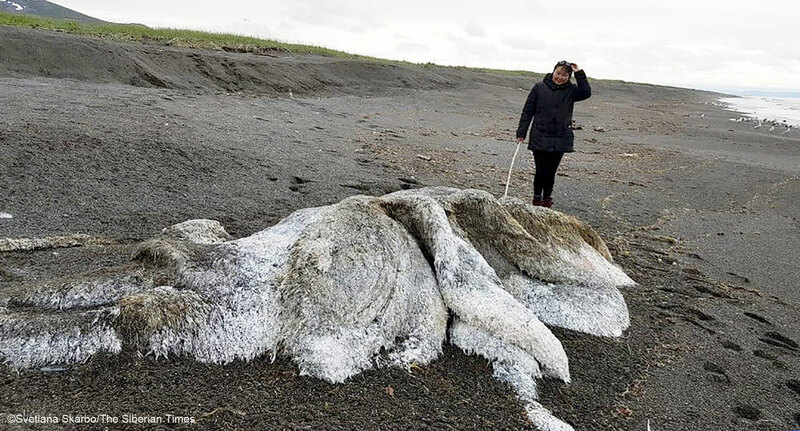 It washed up on the shore of the Kamchatka Peninsula (in the Bering Sea). Covered in “tubular fur” and is too heavy to be moved. Some think it’s part of another animal. Some think it’s seaweed. What do you think? You can read about it here. Body of Sasquatch Found In PA? My friend Jim, a bigfoot enthusiast, sent me this notice. No, it’s not our Bigfoot, of course. But it is a bigfoot here in PA not very far from where I’m sitting right now. There’s a photo (a bit grisly) and some “official statements” from a policeman, but I’m just not sure if I buy it. I do know it’s close enough for me to hitch a ride with Jim and go investigate. But I have a feeling the local law would not roll out the welcome mat for two nosy cartoonists asking about sasquatch corpses. So you’ll just have to read about it here. Loving this look into casual, everyday life for Bigfoot and Scout when they’re not fighting crime. Good way to start the story, nice and calm. Leaves lots of room for contrast in the plot later.